The McCloud Tobacco Full Quill is an 11-inch tall men's Let's Rodeo® Collection cowboy boot with a rich dark brown leather upper with a striking copper and white stitching. The distressed and textured full quill ostrich foot reveals hints of beige, grey, and brown that gives a vintage feel and sports a square toe and unit heel that allows for a relaxed fit. The cushioned insole guarantees lasting comfort in and out of the saddle. This style is proudly Made in the USA with global parts. This is my favorite pair of boots. They are very comfortable and I get alot of compliments. The Ostrich leather on this boot is tough looking. More gray than brown. Fit is spot on. 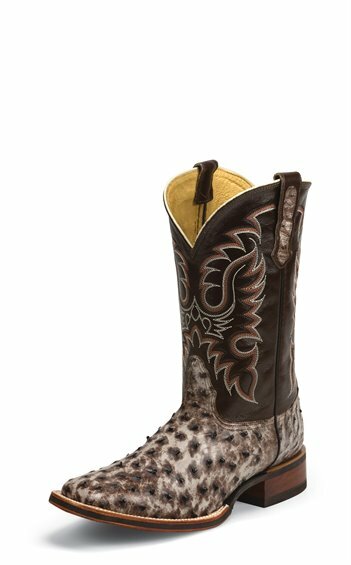 I believe the combination of the rubber Lets Rodeo soles and the Ostrich leather make this boot lighter in weight and more tolerant to water than other boots that I have. I plan on wearing them every day.